TFI Envision Earns Two Automotive Communications Awards | TFI Envision, Inc.
Las Vegas, NV — The Car Care Council Women’s Board (WB) and the Automotive Communication Council (ACC), selected TFI Envision, Inc. as the winner of the 2014 Automotive Communications Award in two categories: “Ad Campaign to Technician/Repair Audience” and “Co-op/Partnering Campaign”. 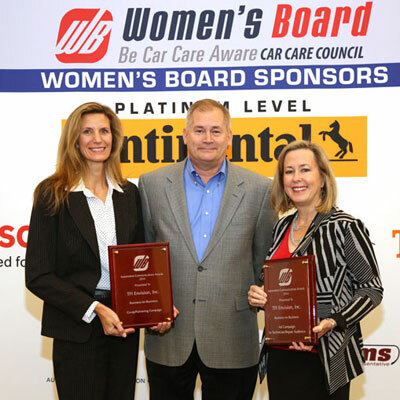 The awards were presented to Elizabeth P. Ball, President | Creative Director, Mary Ellen Butkus, VP of TFI Envision with client Phil Hutchens, VP Engine Management Marketing at Standard Motor Products, Inc. at the 2014 AAPEX Show at the Sands Expo Center, Las Vegas on November 4, 2014. The “Ad Campaign to Technician/Repair Audience” award was for the Standard Motor Products, Inc. Standard TPMS Consumer Focused Marketing Kit. TFI Envision developed this compreshensive kit for service stations to use in identifying and repairing a TPMS issue. Improper tire pressure can result in a catastrophic accident as well as flat tires and uneven tire wear. If there is a problem with a tire, a TPMS light illuminates on the dashboard. When a motorist sees this light, they should not ignore it. The strategy was to identify the reason this light should never be ignored and deliver educational materials that could be used by both the motorist and technician. The kit contains 2 waiting room posters, a bay banner, brochure, table tent and countermat. Each component serves as a way for the motorist and technician to interact with each other about TPMS (tire pressure monitoring system). The “Co-op/Partnering Campaign” award was for Standard Motor Products, Inc. NAPA® Engine System Marketing Materials. When you see the “Check Engine” light come on in your car, you immediately get that nervous feeling that you’re going to be spending a lot of money soon. TFI Envision turned that around by introducing a smiling face into the “Check Engine” light to reassure motorists that this light is a good thing – it is your engine telling you it needs service, so bring your car to NAPA Auto to “Keep Your Engine NAPA® Happy”. This logo was created to quickly identify that NAPA® is the destination for all things related to vehicle maintenance and repair. In addition to the logo development, TFI Envision created an all-inclusive selling guide brochure for engine management, tent cards, and other educational materials. The Car Care Council Women’s Board, supported by the Automotive Communication Council, recognize companies and agencies that provide automotive information to consumers and the trade professionals who interact with them on a daily basis, through outstanding advertising, marketing, merchandising and/or effective PR with the the Automotive Communications Awards competition. Tom Fowler, Inc. wins a Grammy!